LAJA YANG, Kachin State—The dry daytime heat succumbs to a balmy dusk cool, setting the tree-lined valley in a soft yet vivid glow. Aside from the occasional truck or motorcycle, the verdant landscape rings only to the warbles of birds and lowing of cattle in fields on the valley floor. It seems almost too picture-perfect for a war-zone, says Capt Naw Mai, commander of a Kachin Independence Army (KIA) post on the main road from Laiza—a town of around 10,000 people sitting right on the Chinese border—and regional capital Myitkina. Kachin State remains a resource rich region of northern Burma neighboring China, but is the site of almost daily battles between the Burmese government army and ethnic militias since a ceasefire agreed in1994 broke down last June. Pointing across a bridge—a dog-leg left off the main road—to a Burmese army post a mere 100 yards away, Naw Mai claims, “Even though there is fighting elsewhere, we leave them alone, as it is our policy not to attack first.” There is another Burmese army position less than a mile away on the same main route, but both are isolated from the larger military posts elsewhere in Kachin State. Another reason, Naw Mai says, why there is no need for the KIA to attack the enemy here. That said, later the same night, the Burmese army shelled KIA positions at Loi Je, close to the ethnic armed group's second main stronghold at Mai Ja Yang, several hours drive from Laiza. There was also gunfire at Nam San Yang, an already burnt-out village less than an hour away from Laja Yang. 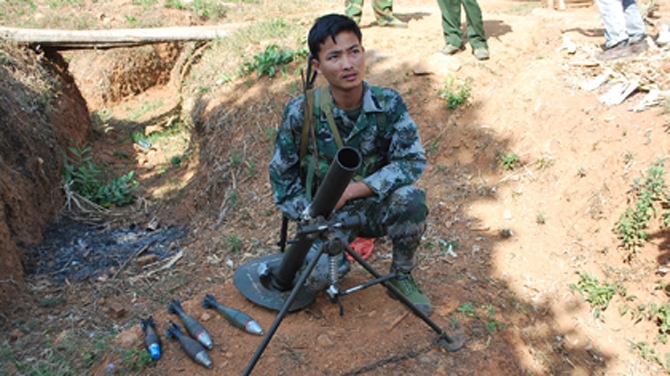 Fighting has left both the KIA and government forces in control of an amorphous and criss-crossing patchworks of territory close to the Sino-Burmese border. The KIA believes they have the upper hand in ground-level, small-arms combat in their mountain redoubts. But, faced by a much larger and better-armed adversary, they have been forced to retreat from several areas since fighting began, leaving the Burmese government in control of perhaps 70-75 percent of the northern state. Two rounds of peace-talks have been held so far, but, in an indication of how little common ground can be found, neither side can even agree where to stage the next parley. Back in Laiza, KIA headquarters for the past seven months, Col Ji Nong of the group's central committee says he has been involved in every negotiation with the Burmese government since 1994. Ji Nong says that even if the KIO and government can make some progress, his organization is bound by a commitment to other ethnic armed groups as part of the United Nationalities Federal Council which will meet on Feb. 28 in Chiang Mai, Thailand. Back at Laja Yang, a billboard commemorating Burma's 1988 student rebellion and featuring a larger-than-life image of Suu Kyi sits right in the Burmese soldiers' line of sight, positioned as if to taunt. Standing nearby, and pointing again to the Burmese army post across the bridge where soldiers can be seen looking through binoculars across at the KIA, Naw Mai outlines the uneasy modus vivendi on this sector of the frontline. KIO/KIA is the Government of the Kachins. The sovereign of the Kachins must be respected. The Union Government must avoid any colonization type of activities in Kachin including the puppet Kachin State Government. Fully support Mawshe. How can the KIA sign the peace agreement while while there are invasion troops next to them. It is not a political solution, but threatening KIA with the troops to get the signature. KIA will never sign such agreement at the Gun point. Politicians must have the power to order the Military. The peace talk with between the Government and Kachins indicated clearly that there is no power in the hand of the Civilian Government to influence the Army at all. KIA obey the order of KIO, but not Min Aung Hlaing. The International Community must must learn from this lessons that the Democracy in Burma is just very fragile and the real power is still in the hand of Army who do not obey the order of the Parliament. It is almost sure that the Democratic reform will be broken sometimes in the near future when the Army feel that the present openness threaten their advantages. Andy first of all: Its the central government that attacks the KIA. Only thing the KIA does is defend themselves on their own territory. I agree with the KIA/KIO that there must be a political solution before a ceasfire is signed. The reason for that is that the central government has never given any federal rights to the minorities. The 2008 constitution says that the ethnic armies have to become border guard forces or lay down their weapons. The KIO/KIA is never going to accept that, so why would they sign a ceasfire when their is no possible political solution afterwards? The guy's RIGHT on the MONEY. However, he needs to know that CHINA WANTS Kachin Land in addition to Wa and Shan lands as well. 30 Billion Yuan given to Than Shwe on his last visit to China is the MOTIVE BEHIND UNCEASING BATTLES in Kachin land today lest you guys forget. In case KIA GAVE WAY to Min Aung Hlaing's ONSLAUGHTS the WAR would be OVER and the Chinese communists will CONTINUE with their Myitsone Dam Project, pipelines, rails and roads as well. BURMA WOULD BE FLOODED WITH ETHNIC CHINESE in a blink of an eye and FOREVER. And the communists in Beijing will INCLUDE BURMA as a PROVINCE of CHINA, any bets? So when both sides will be talking about political solution, they will still be fighting on the ground ??? It is like 'to put the cart before the horse.' Why can't they (KIA) agree on political solution after 'temporary' ceasefire. And then political solution will rest assure permanant ceasefire. We, Burmese people, want peace but never want to solve political problem. Ethnic insurgencies are not simply militarization but political dispute. Burmese majority wants a unitary democratic country but ethnic people wants a federal democratic union based on Pang Long agreement. Ethnic rebels made ceasefire many times hoping political dialogue will come. But Burmese side always historically avoid or ignore ethnic voices. So, we need "not ceasefire" but "political solution". Political solution will lead to forever peace.